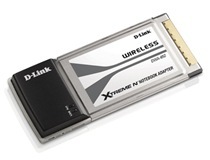 The D-Link Xtreme N Notebook Adapter (DWA-652) is a 802.11n wireless client that delivers unrivaled wireless performance for your notebook computer. This wireless adapter delivers up to 14x faster speeds* and 6x farther range than 802.11g while staying backward compatible with 802.11g networks. · Update XP/XP64/2000 driver to v7.6.1.221 and Vista/Vista64 driver to v7.6.1.194. · Follow Spec of WLAN utility & driver description V1.05. · Update CD version to v1.50.